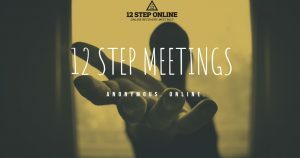 12 Step Online is a safe place for people to find strength, healing, recovery and support through working the 12 steps as outlined in the 12 Steps and 12 Traditions book of Alcoholics Anonymous. We help by providing online discussion, meetings, chat, forums and resources aimed around working the 12 steps. Our meetings are registered with the AA Online Intergroup.